Know ye not that ye are the temple of God, and that the Spirit of God dwelleth in you (1 Corinthians 3:16)? Jesus answered and said unto them, Destroy this temple, and in three days I will raise it up (John 2:19) .... But he spake of the temple of his body (John 2:21). Then said the Jews, Forty and six years was this temple in building, and wilt thou rear it up in three days (John 2:20)? Defile the Temple of God? 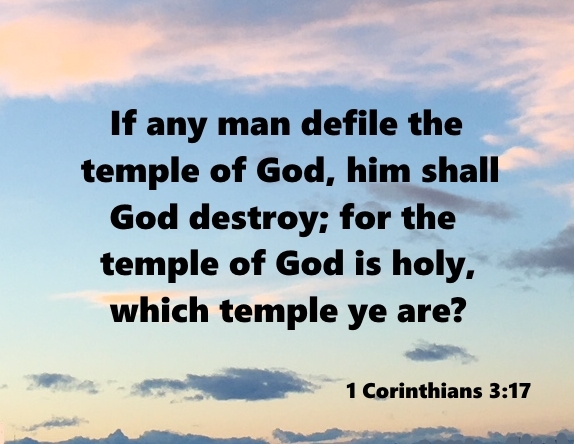 If any man defile the temple of God, him shall God destroy; for the temple of God is holy, which temple ye are (1 Corinthians 3:17). But what comes out of the mouth proceeds from the heart, and this defiles a person. For out of the heart come evil thoughts, murder, adultery, sexual immorality, theft, false witness, slander. These are what defile a person....(Matthew 15:18-20 ESV). Or do you not know that the unrighteous will not inherit the kingdom of God? Do not be deceived: neither the sexually immoral, nor idolaters, nor adulterers, nor men who practice homosexuality, nor thieves, nor the greedy, nor drunkards, nor revilers, nor swindlers will inherit the kingdom of God (1 Corinthians 6:9-10 ESV). Or do you not know that your body is a temple of the Holy Spirit within you, whom you have from God? You are not your own, for you were bought with a price. So glorify God in your body (1 Corinthians 6:19-20 ESV). We must, at all times live a repentant lifestyle, a life without wanton, willful sin in and when we do sin we confess our sins (1 John 1:9), and repent, turning fully back to Jesus Christ, going forward as a temple of God.